The game in “Game Night” is a murder mystery party in which the mystery becomes real and the potential of murder genuine. This is connected to Brooks (Kyle Chandler), Max’s faux-charismatic brother, host of the murder mystery party, not necessarily being on the up and up. Max and his wife Annie (Rachel McAdams), as well as the other quartet of game night participants, gradually unravel that the ersatz is authentic leading to a desperate search and rescue mission. No matter how real the situation gets, however, the movie never takes it completely seriously, diffusing every macabre turn with a pop culture reference. 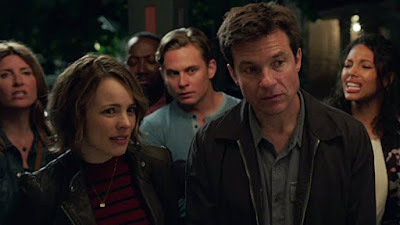 A lot of movies play that sort of inside baseball just to earn cheap laughs, but “Game Night” makes these references the point, nearly every allusion to a celebrity or a movie sort of existing as the key to unlocking the jam in which they find themselves, ironical video game cheat codes. 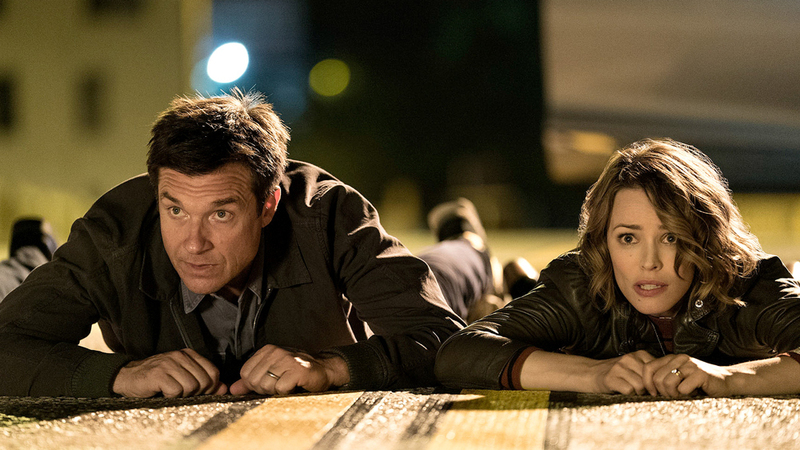 It sounds like a simple send-up of summer entertainment, and it sort of is, but also, to directors John Francis Daley and Jonathan Goldstein’s credit, many of “Game Night’s” action sequences forgo the scourge of shaky cam. Granted, neither a mid-movie car chase nor a later foot chase, of sorts, involving a fabergé egg exactly re-invent the action movie wheel, but they nevertheless pop on account of their visual clarity. You can see stuff! On the other hand, the movie’s attempts at actual drama are far less edifying. Darkness worth exploring lurks in “Game Night”, glimpsed in the counterpoint of Cliff Martinez’s synth score over an aerial shot of sprawling suburban tract and in the comically moody performance of Jessie Plemmons. As a cop living next door to the Davis’s who is obsessed with an ex, Plemmons wields a monotone drawl and unblinking eyes to fine effect, intimating a melancholy well beyond the normal parameters. Not that the movie knows what to do with his shifty aura, unfortunately, as the character’s heartbreak ultimately proves emotionally expendable to further the film’s overall What’s Next?! sensation. “Game Night” strains to make things personal through Max and Annie’s unsuccessful attempts to have a baby, outlined in the prologue, as well as the fellow murder mystery participants’ respective relationship crises. These, however, come across like role-playing game statistics as opposed to anything of actual emotional value. What’s more, Max’s struggles at conceiving with Annie are suggested as being tied to a crisis of confidence in relation to his brother, though in the movie’s language what allows him to finally cross this hurdle is not so much coming to terms with Brooks as getting wild and crazy in his life. The movie doesn’t seem to know this, and neither, frankly, does Bateman, who does his straight-man comic thing pretty well, as he often does, but never really becomes unwound. Rachel McAdams does, making you wish the movie was a little more about her, a little less about him, but what else is new? She has long excelled at grounding absurdity, as her wonderful, underrated “Red Eye” performance can attest, and in a sequence where she is tasked with excavating a bullet from her beau’s arm, guided by instructions on her smartphone, she comes across both in over her head and getting a kick out it anyway, a delicate balance for which all of “Game Night” strives but cannot always manage. McAdams, however, is even better before that, in the moments when she thinks nothing is real. It’s something akin to Bill Murray’s “The Man Who Knew Too Little”, but with more of an edge. Indeed, when she is made to quote Rosanna Arquette’s iconic opening commands in “Pulp Fiction”, McAdams does not so much quote the sequence as ineffably get inside its skin. Not long after, as Annie plays Third Eye Blind on the jukebox and dances with a pistol waving near her lips, it is both funny and frightening, someone so deep in the game that, for a second, you’re not sure she’ll ever find her way out. I sort of wish she hadn’t.